The most common question I get asked when someone sees one of my folded books is, "How did you learn to do that?" 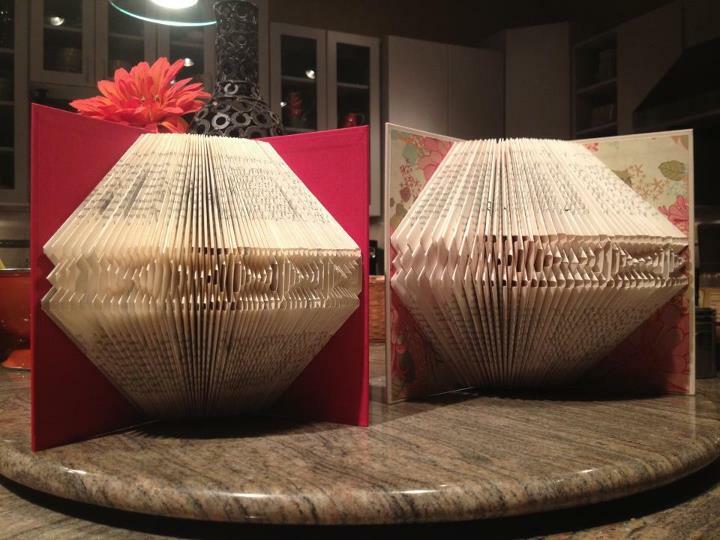 The first folded book projects I did came from The Repurposed Library, the book I bought in Palm Springs. It was a very simple design with a single point fold on each page, similar to those old Reader's Digest Christmas trees we all used make back in the day, but with a book cover. I just used a book I bought at the Dollar Store. Here it is reimagined and sitting in my mother's house. 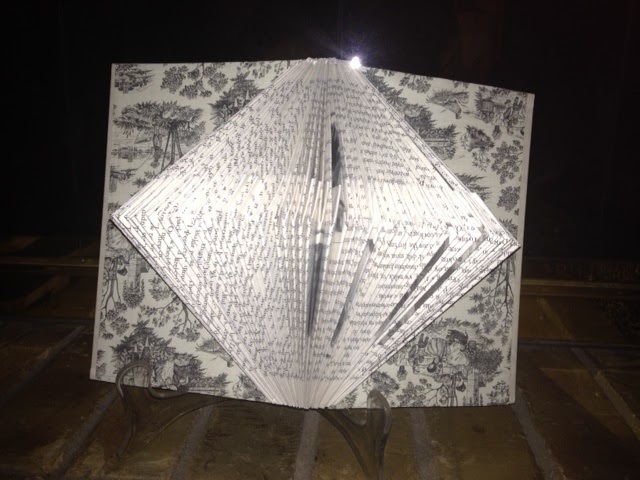 What I liked about this project was that I got to cover the plain endpapers with scrapbook paper. I learned that I love scrapbook paper, even though I don't scrapbook. And by love I mean hoard. Anyway, I started searching on the Internet for more folded book projects. That's when I ran across the work of Isaac Salazar. Unfortunately he is no longer accepting custom orders as he is completely booked (no pun intended) thru the end of 2013. Thank you all for your continued support! I started printing out his pictures and blowing them up to see if I could figure out how he did it. No luck. I kept searching, and that's when I discovered Heather Eddy at Rhymes With Magic. She has a GREAT website, free patterns, and very inexpensive tutorials on how to fold books on her Etsy store. In fact, she published a new one just last week. And in the end she even taught me how to fold words, like my name. Obviously she did not teach me how to count because I got as far as S-T-E-P-H and ran out of pages. You will learn that running out of pages is a recurring theme in my work. Regardless, check out those endpapers! The butterflies are foil and in real life they shine! I think I will go back upstairs now and smell my scrapbook paper. Did I mention...yes, I did. 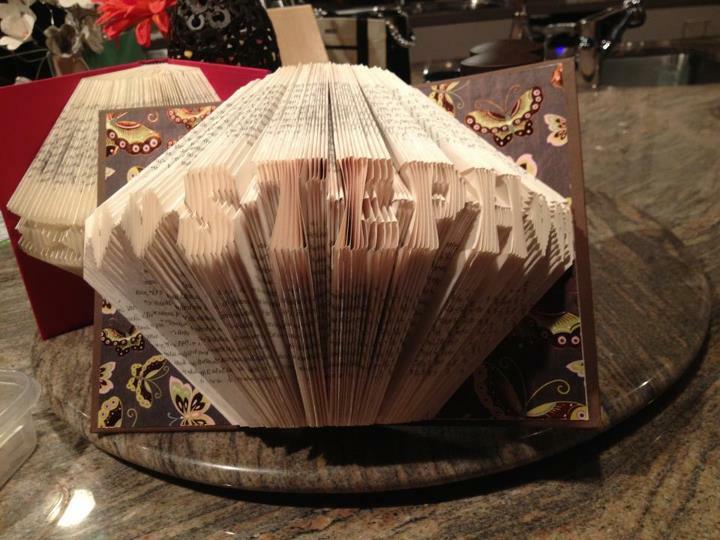 Anyway, the moral of the story is if you want to get started folding books, start with Heather's tutorials. In today's Books I Read news: There is nothing better than getting a notice like the one I got today from LibraryThing.com. Congratulations. You've been selected to receive an Early Reviewers copy of Thomas Jefferson's Creme Brulee by Thomas J. Craughwell from the August 2012 batch. In 1784, Thomas Jefferson struck a deal with one of his slaves, 19-year-old James Hemings. The founding Father was traveling to Paris and wanted to bring James along “for a particular purpose” – to master the art of French cooking. In exchange for James’s cooperation, Jefferson would grant his freedom. Thus began one of the strangest partnerships in U.S. history. As James apprenticed under master French chefs, Jefferson studied the cultivation of French crops (especially grapes for winemaking) so the might be replicated in American agriculture. The two men returned home with such marvels as pasta, French fries, champagne, macaroni and cheese, crème brûlée, and a host of other treats. This narrative nonfiction book tells the fascinating story behind their remarkable adventure – and includes 12 of their original recipes! Over 1000 people requested it; only 30 copies available; and I got one of them. Another book! A free book! We wants it, we needs it. Must have the precious. When one is a crafter, supply acquisition really doesn't count as hoarding. Those supplies are referred to as one's stash, a crucial part of crafting. You never know when you will need foil-embossed butterfly scrapbook paper at midnight, or a turquoise and chartreuse Reader's Digest volume on short notice. So, go forth and aquire! More is better!! What a relief! 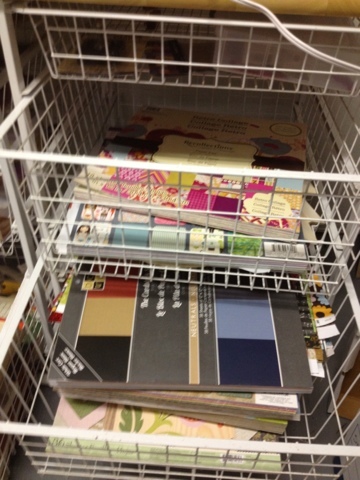 I've cancelled my appointment with the shrink which frees up some cash for more books and scrapbook paper. Score!